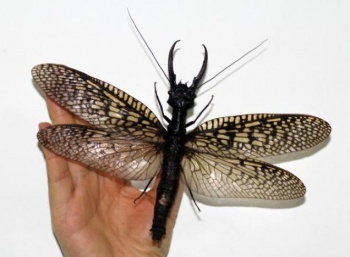 The Insect Museum of West China found the largest dobsonfly and its wingspan measures over 8 inches wide! If you're the kind of person who squirms whenever you see larger than normal insects, then this bit of news might give you nightmares. In China, the Insect Museum of West China went on an expedition and found the largest dobsonfly seen so far. This particular insect (pictured) has a wingspan of 21 centimeters (over 8 inches). The previous largest dobsonfly was found in Brazil and had a wingspan of 19.1 centimeters (7.48 inches). For those who are curious, while 8 inches for its wingspan is considered wide, the average male and female specimens of this particular insect has a wingspan of 5 inches. While I don't think I easily get scared when it comes to insects, I admit, seeing this fly around anywhere near my vicinity might cause me to run away in panic. I mean, just look at its mouth and body; it's like a mad scientist tried to see what the outcome would be when you cross-mated a spider, wasp and a scorpion. And don't think this insect is exclusive to China, either. Apparently, it can be found in many different countries, which just makes seeing one in the flesh a little bit more real.